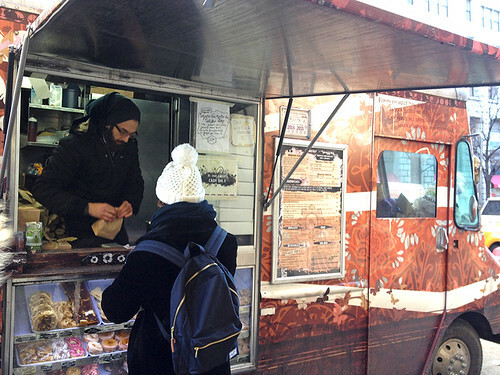 Tragically, the Cinnamon Snail announced that at the end of this month, their food truck will no longer be operating. This news hit me hard, like the way you feel as a kid when you drop your ice cream cone on the ground (or, even as an adult, still!) 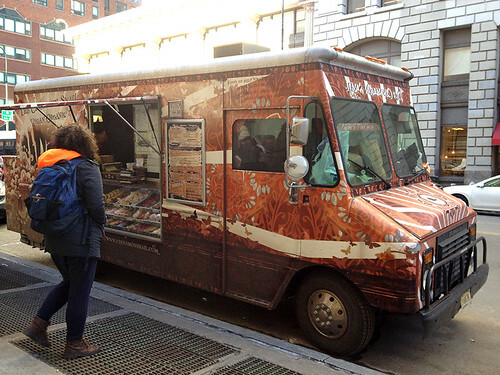 – I have always looked forward to days off when I can grab breakfast or lunch from the Cinnamon Snail, or weekends when I happily find excuses to run errands in Manhattan near where the truck will be parked, so I can pick up a box of donuts to bring home. It’s hard to believe that these days are coming to an end! Seriously, how incredible are these donuts?!?! What the future is for the Snail crew and their amazing food is uncertain at this time (read their facebook post for more details), so if you have been craving a bourbon crème brulee donut or a decadently delicious veggie burger, now is the time to get one, before they are all gone! And if you still have not tried the Cinnamon Snail’s food, please do yourself a favor and try it at least once before you no longer have the chance to – even if you aren’t a vegetarian or vegan, I promise you will be blown away! 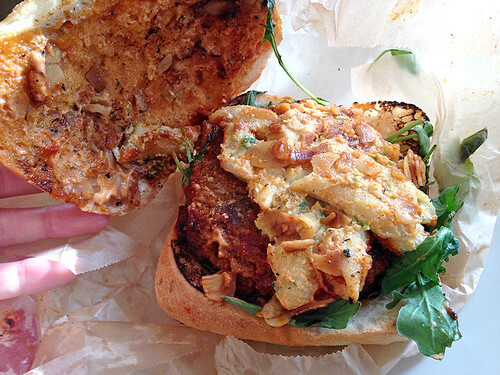 The smoked chili bourbon BBQ seitan burger with jalapeno mac-n-cheese, smoked almond bacon, arugula, and chipotle mayo on grilled herb focaccia. Yes, you read that correctly. Are you drooling? I was, the minute I saw that sign advertising the daily special. 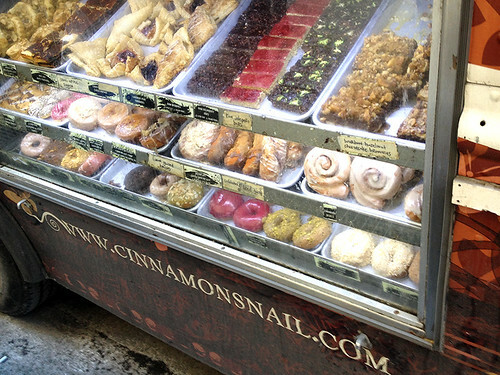 My most recent trip to the Cinnamon Snail was on a Saturday when I had an early morning appointment in Manhattan. Remembering that the Snail had said they would be parked on 14th street that day, I eagerly made my way there for lunch. Bonus: no line! A rarity for the Snail! Because it is FREEZING outside in NYC right now, I resisted the temptation to be one of those people messily eating a meal on the subway, and patiently waited until I got home to dig into what sounded like a veritable holy grail of veggie burgers. The toppings are a foodie/vegan/glutton’s dream come true. Just look at that mac-n-cheese! Okay, it’s a little smushed from being carried all the way back to Queens, but just take a minute to pause and process all the delicious flavors that are combined in this incredible burger: bourbon, barbecue, mac-n-cheese, bacon, jalapeno. And it's all vegan. Holy hell! And each one was as delicious as it sounds, coming together to create a masterpiece. 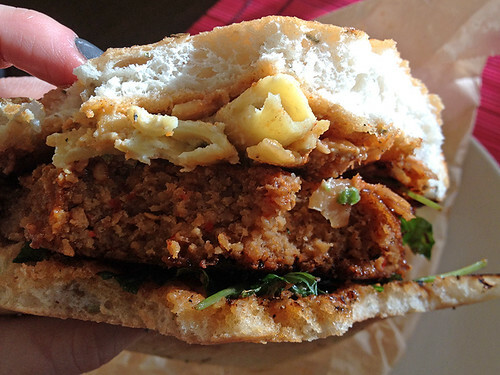 The seitan patty was sweet, spicy, smokey, savory, hearty, and simply amazing. 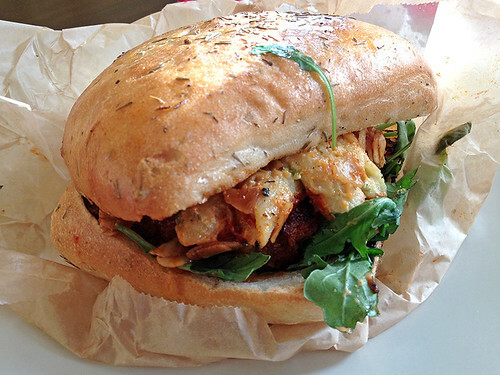 It’s thick, it will fill you up – and it holds together like a proper veggie patty should! The herbed focaccia bun was sweet and soft, and tasted oh-so-good. My only complaint (literally, my ONLY complaint about this entire burger) was that the bun was a bit large for even this monster patty and luxurious array of toppings (probably because of the fact that the bun is square and has all that extra bread at the corners with no patty or toppings to fill it - but this is a pretty minor, nit-picky complaint in the face of so much awesomeness). This burger was the weekly special last week, but I don’t think it’s on the specials for this week (or I would probably be seriously considering skipping work to go eat it). However, you can try the Ancho Chili Seitan Burger which I have also reviewed (and also gave 5 stars to) and which is on the regular menu! And hopefully if the Cinnamon Snail is reincarnated as a brick-and-mortar restaurant or some other type of food vendor, they will bring back the smoked chili bourbon BBQ seitan burger… as its #1 fan, I think I would cry if I never had the chance to taste that deliciousness ever again! And of course, don’t forget to try a donut (vanilla bourbon crème brulee donuts – need I say more??? The Cinnamon Snail understands my love/need for all things bourbon-flavored!) or another dessert! 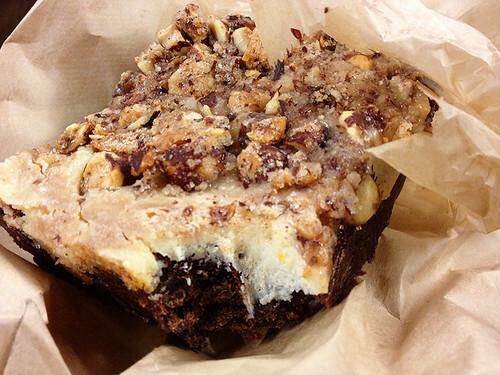 I got a bourbon hazelnut cheesecake brownie, which I shamelessly ate on the subway on my way home (dessert before dinner is allowed when the dessert is the less messy of the two options, and the food is so good you can’t wait until you get home!). Go out and show your love for the Cinnamon Snail and eat some amazing food in the next week and a half before the truck is off the streets for good! Cinnamon Snail, you are so loved – and you will be so missed! Thank you for all the love and deliciousness you have shared over the years! Well, this is sad news. I've never been to NYC, but I was hoping that, one day when I finally made it there, I could eat at Cinnamon Snail. Maybe it will be a full restaurant by then! I hope! Man, that burger looks like the BEST THING EVER. Anything topped with mac & cheeze is a winner in my book. Love your photos- particularly since I opted for Thai BBQ tempeh instead of this special TWICE!! That burger looks so deliciously intense! So sad they are closing.